A complete two days Itinerary of an Adventurous Trip to Polo Forest. We keep searching for new places to explore and this time while searching a new place we came across an adventurous weekend camp to Polo Forest by Invincible NGO. We booked a trip for 15th and 16th July 2017. Following is the complete Itinerary of our two days adventurous trip to Polo Forest. This was our second trip with Invincible NGO team. First one was more adventurous one to Dalhousie. We have tried to provide detailed information about our trip with all the photos and videos to justify the beauty with its adventurous version. Invincible NGO usually starts all the trips from Ahmedabad. A reporting point is assigned to all the participants. And the reporting point for this trip was the canteen of the L. D Engineering College in Ahmedabad. We had to report there by 1.20 am on 15th July 2017. We were a group of 108 participants and approximately 8 – 10 Instructors and Volunteers to guide us. Two buses had been arranged for us from Ahmedabad to start our trip to Polo Forest. We had started in the midnight of 15th July at 2.30 am from Ahmedabad. With a few stops on the way we had finally reached Idar Bus Depot to freshen up as that was the last stop with washroom facilities. 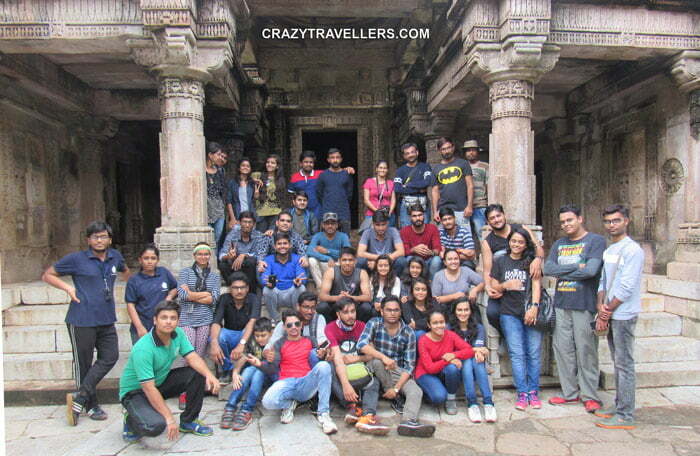 We had been informed there about the start of our adventurous trip with Idar Fort. Our instructors were emphasizing more on the beauty of the sunrise point and wanted us to reach to the topmost point of the Idariyo Gadh before the Sun rises. 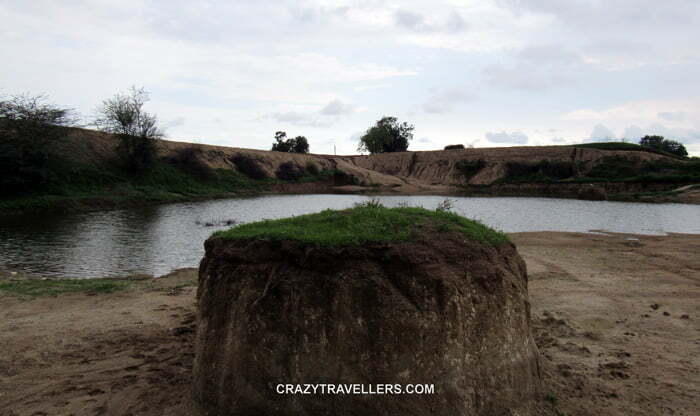 By the time we were being informed more about Idariyo Gadh, we had reached there. A team of instructors was already waiting there for our arrival and surprisingly this team was inclusive of Mr. Rushiraj Mori – The founder of Invincible NGO. Everybody was assembled there to arrange our group of 108 people into smaller groups to organize the trip in a smooth manner. This is a common practice of Invincible NGO. 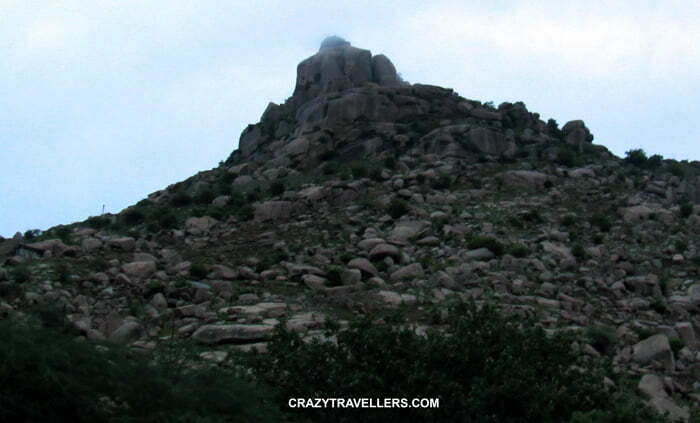 We were informed about our way to the top most point of the Idariyo Gadh. 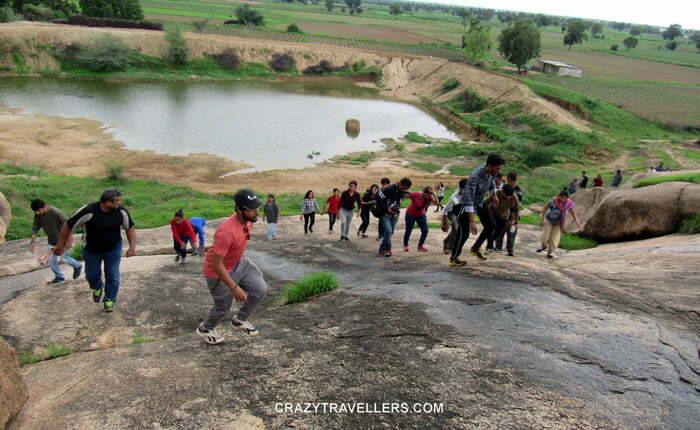 And soon we started our journey to explore the Idariyo Gadh – A Hill with steps, rocks and more than 15 places worth visiting on the Hill itself. We returned from our fascinating climb to the Idariyo Gadh and again assembled to have our breakfast. There were a few stalls with water bottles and packets of snacks. After breakfast, we again boarded into our buses to reach to our next destination which was going to be our stay for two days. This was the time when we actually had a short nap since our start of our trip. Soon we reached to the place of our stay, the hall belonging to the temple authorities. We were given a time of two hours to get fresh and meanwhile our lunch was getting ready for us. The place was completely surrounded by the forest and the hall had no washrooms so naturally everyone started searching for options to get fresh. Female participants were lucky enough to have a tented portable washroom arrangement made by the Invincible team. But ultimately, no arrangement for bathing…… There were two free flowing sources of water in the open, one was the pipe from the temple and other was a Gau-mukh (Water flowing from the mouth of a Cow). So, this was the time to decide, whether bathe in open in either of the two options or else just go and change your clothes. Obviously the female participants and most of the male participants too chose the second option whereas a few of them enjoyed the bath and were fresh again. This trip was an adventurous trip by Invincible NGO so we had no other option but to accept the adventure in the stay part as well. You can definitely have better options for staying there. Details of the other options available for stay can be found here. After all that juggling, everyone was finally ready for lunch. We had our lunch, and boarded our buses for our next destination. A few minutes of drive led us to the Vanaj Dam. 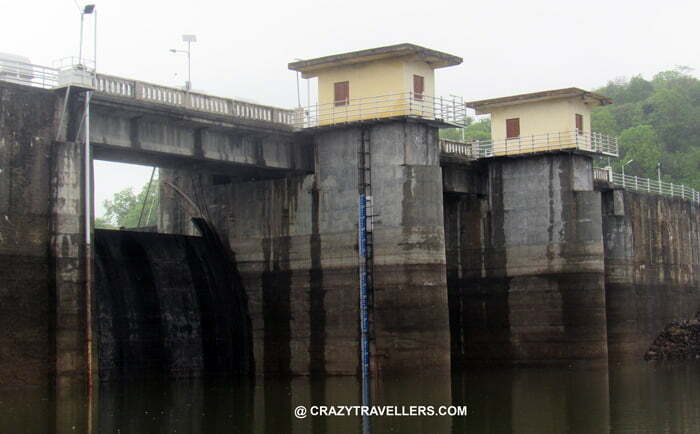 Vanaj Dam is a wonderful picturesque location of the Polo Forest region. A detail description of the Dam is here. After 40 minutes of enjoyment at the Dam we again boarded the bus and were brought to the Interpretation Center of the Polo Forest. Want to know about the Interpretation Center? Read Here. When we came out of the Interpretation Center, a few Volunteers of the Invincible Team guided us to a small check dam which is very near to the Interpretation Center. 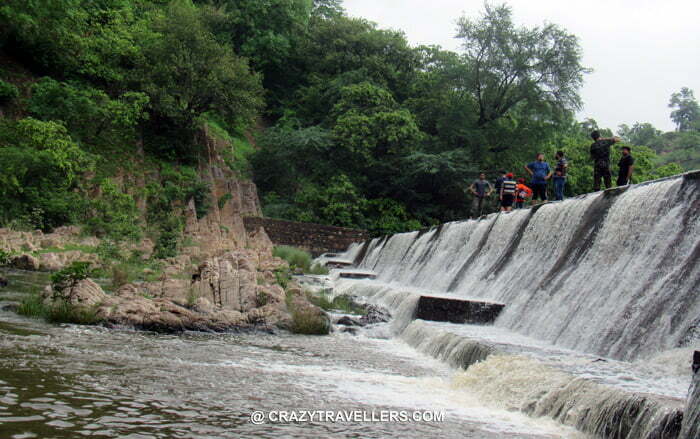 So we walked and reached there to enjoy a wonderful waterfall from the check dam. Very few from our group had actually come down to enjoy the waterfall as the steps taking you down to the waterfall are really quite risky. While climbing the stairs to come up we found a little mouse with a spiky crown on the stairs. It was also climbing the stairs in its own way as if it was climbing a rock. Here is the Video that we had captured of its climb. Again we boarded our buses to reach to our place of stay. After some refreshment we had our dinner and started preparing our beds which were a foam sheet and a bed sheet on it. One of our volunteers of the Invincible Team and we too were quite excited about the camp fire. But most of the participants were very tired and did not want to participate any more activities and wanted to go to sleep. As such we had to wake up early next morning to move our journey further. So we too went to sleep by around 9.30 pm. Early morning 6.00 am our volunteers came to wake us up. We were again explained our schedule for the day and had been given 2 hours’ time to get ready and have our breakfast. We also had to pack our bags before leaving the hall. Again everyone started searching options for getting fresh. It was second day, so obviously even the people who had just changed their clothes on Day 1 had lost their cool that day. Luckily a jugaad (setting) for the female participants was found in the temple premises. The priest of the temple had then allowed the female participants to use the washroom facilities in the resident area of the temple. We, the ladies of the group, were feeling on the top of this world enjoying the privilege of being a woman. The feeling was as if we had been served with an ice cream after a week of fasting. Finishing up everything, we finally had our breakfast and got ready to leave for a rocking experience. Two major adventurers of the trip were left for us to experience. And so we were very excited for the day. We again boarded our buses to start our journey for the day. There was a little change as compared to Day 1. First day both the buses went to all the places together but on Day 2, both the buses had to go to different places to manage the time for the activities for such a big group. 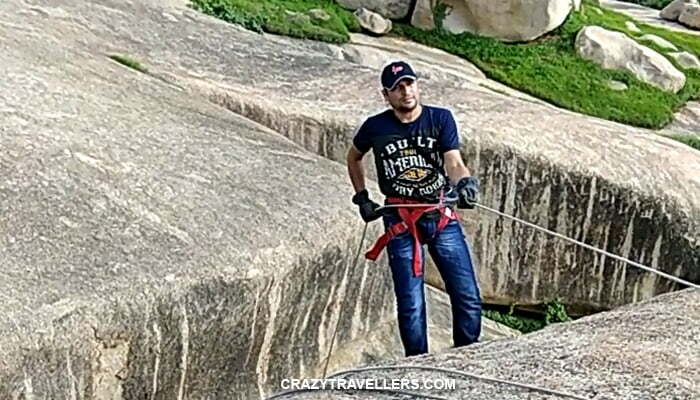 The day had been divided into two parts, one for rock climbing and the other for the rappelling. Accordingly the buses were also divided, one was supposed to leave for rock climbing and the other for rappelling. The buses were going to be shuffled in the second part of the day. Our bus was supposed to leave for rock climbing in the first part of the day. So, we started our journey to Polo Forest. In the bus, we were listening to the list of adventures we will be going for by the day and our destination arrived. It was a beautiful pond that had captured our sight on the very first instance. We started clicking photos there and the sound of the whistle was heard. This was a call for us to assemble, as usual. And here came the new entry to our team, our guide – Mr. Vipul. Our instructor introduced him and handed over our team to him. While Mr. Vipul was explaining us about the Forest, our sight caught an ancient temple. So, what next, my hubby, silently reached out for that temple and started shooting it. The moment he returned, our guide took us to the same temple and started informing us about the temple. That was the place for our first group photo. It was Shiv Shakti Temple. And this was the starting point of our rock climbing. 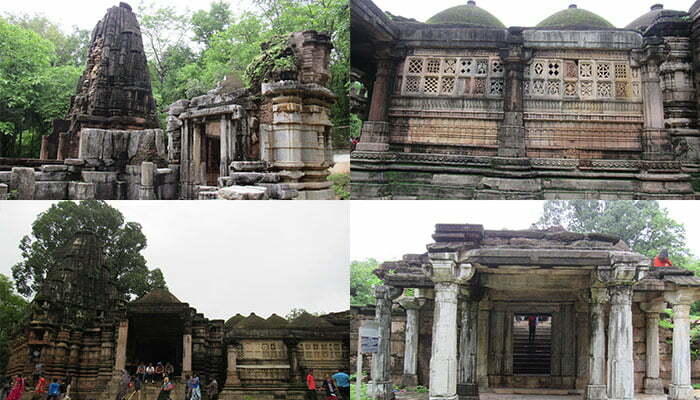 Our Guide informed us about the four Gates in the Polo Forest and had even shown us one of the four gates in the Polo Forest, which was just in front of the temple. 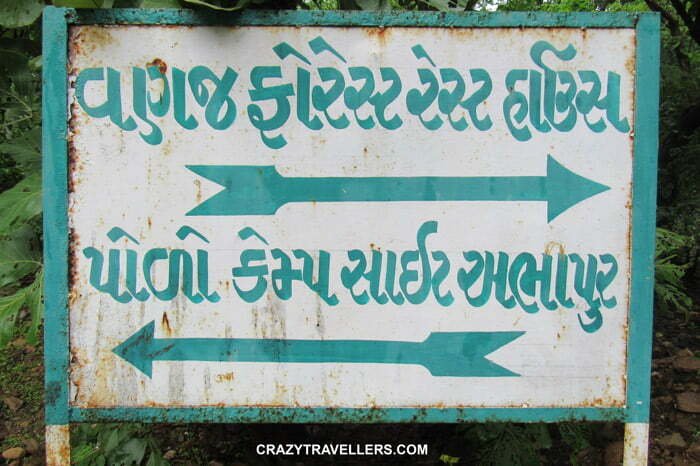 The Guide had emphasized on walking in a single line as the forest had wild snakes and animals. According to him, the snakes will change their direction sensing our vibrations. So obeying him, we all started walking behind him in a single line. Soon all of us were stopped at the trunk of a tree and Mr. Vipul started informing about the flora and the fauna of the region. After providing the information, he asked us to close our eyes and take deep breaths for a few minutes to experience the Nature around us at its best. On climbing a bit further, we again saw the small check dam, of course from a height this time, where we had been a day before. Read in detail about our trek here. The top most point of the Hill had an Echo point which was really a wonderful experience to hear the Echos of “Jai Hind” , “Vande Maatram” and many more. 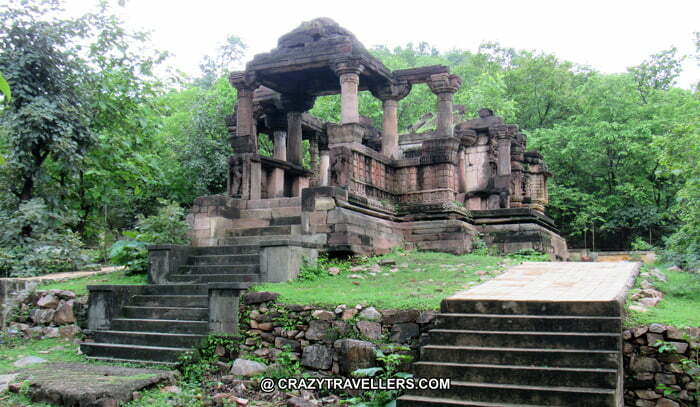 We came down by another path which led to beautifully carved ancient temples, a Shiv Temple and a Jain temple. Our guide informed about the minute details taken in account at the time of making of this wonderful architectures. Read about them in detail here. After exploring the temples in details we finally boarded back in our buses to move back to our stay. We reached there a bit tired but still excited as one more adventure was left for us. This time we were going to live that place with our bags, so were given half an hour’s time to completely pack our belongings and place them in our bus. We had our lunch and were ready to go for our last adventure of the trip. Finally we left for Rappelling. We were going to perform this activity on a rock in a village named Sapawada near Polo Forest. After a drive of almost half an hour we reached to our destination. We got down from our buses and after walking for a few minutes we reached to a wonderful location. A perfect throne made by the Mother Nature to get mesmerized by its marvellous beauty. We were seriously willing to jump into the water rather than moving ahead. But respecting the instructors with us was a priority then. So putting a heavy stone on our hearts we had to move on. But we did not regret our decision of moving ahead. Our instructors were waiting for us at the rock to teach us a new method of climbing a rock. And believe us, it seemed to be quite difficult and in fact was very difficult way to climb but only till you are in the process of climbing it. The moment we reached up, we felt victorious, unaware of the next victory to overcome. Next was Rappelling…… We were informed by Mr. Rushiraj that the morning batch had to get down from a 20 feet rock only due to the rainfall. He informed us that we were lucky enough to have a clear weather and hence we would be getting down from a 70 feet high rock. We were explained about the instruments that we were going to use. A harness, rope, a pair of gloves, a carabiner and a figure of eight were the list of instruments. As all of you know, my dear hubby, already had many such experiences, so he was the second one to go down the rock by rappelling. He wanted to shoot me from there. I was very confident after looking him go so seamlessly. But before my turn came, my eyes witnessed three people losing their balance while going down. This is what made me fearful again. But slowly and gradually I gained by courage back and was getting ready to go down when I heard an instructor calling me out to go down. And this was it, with a mixed feeling of courage and fear, I finally started descending from the rock. The Instructor with me had already sensed my feeling and so he was constantly advising me until finally I gained a very good from him. His words “Good going” and the same type of words from the instructors beneath me at the feet of the rock made me more confident. And I was finally down. Hurrayyyyyy. I again achieved a Victory. I always say that my hubby can really bring impossible things out of me. A big thanks to the Invincible Team again. We were running late, as per the schedule we were supposed to reach Ahmedabad by 8.30 pm. Actually we started from Sapawada at 8.00 pm and stopped at 9.10 pm at a restaurant for dinner. We left from there for Ahmedabad at 9.50 pm. We reached Ahmedabad at 11.45 pm. And finally we reached at our home at 2.15 am on 17th July 2017.